Graham Scott will take charge of his third Manchester City game this season when the Blues travel to Bristol City on Tuesday night with a place in the Carabao Cup final on the line. 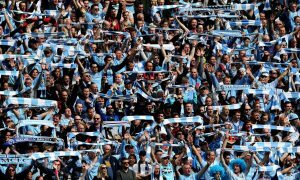 City hold a slender 2-1 lead over the Championship side thanks to a Sergio Aguero injury time winner at the Etihad, and face a challenge to reach Wembley, where the victors will face either Arsenal or Chelsea. Pep Guardiola’s men have a 100 per cent record under Scott this season, after he had the whistle for the 2-0 league win away at Leicester in November, and more recently the 4-1 FA Cup triumph over Burnley on 6 January. Having been referee for only one Championship game this campaign, this will be Scott’s first Bristol City assignment this season.